One of the justifications you often hear for labels continuing to take the lion’s share of payouts from Spotify etc. is that they invest a huge amount more in A&R than those who develop songwriters. Not true, says UK Music’s new Measuring Music report. 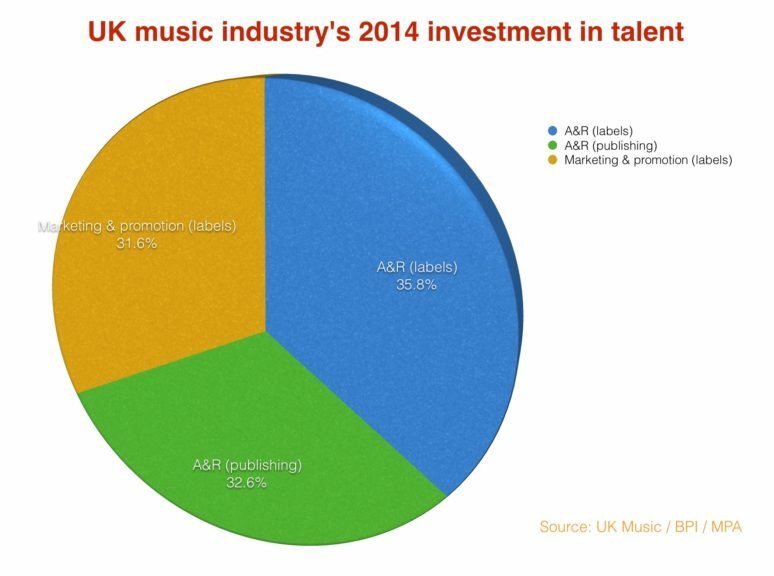 According the trade body’s numbers, record labels spent £178m on A&R in 2014. That was certainly ahead of the investment in songwriters made by music publishers – but by less than you might assume. Publishers spend £162m on writers in the year, according to the UK Music report. If you count that as ‘pure’ A&R investment, it was just £16m behind their peers in record companies. However, where record labels come into their own is in the field of marketing and promoting acts. According to UK Music’s report, labels spent £157m on this pursuit in 2014. That brought the total ‘investment’ by labels and publisher in artists and songwriters to £497m, an increase of over £70m on the £420m figure cited in UK Music’s report from the previous year. As reported elsewhere, the latest Measuring Music report says that the UK music business – across live, records, publishing and more – contributed £4.1m to the UK economy in 2014.